After seeing the turn up at Tuesday’s party for HiMolde’s international students, Marthe Owesen, head of the Åpningsuka commitee, calls party a great success. It’s Tuesday night and the centre of Molde is quiet. While strolling across the bus station, the only other people are those transferring between buses, determinately headed somewhere. Getting closer to Kompagniet, there is loud music and laughter and an on-going party for the newly arrived international students at HiMolde. What are your expectations for your time in Molde: I hope to have a great time and perhaps travel around and explore a bit. I’m from a town that’s double the size of Molde, so it’s a new experience just living here. But I must say I’m a bit sceptical to the weather, I arrived on Friday and today’s the first day that it’s not raining. What do you do when it rains all day? What are your expectations for your time in Molde: I arrived on Thursday, last week, so a friend and I have already gotten the time to go on a little car trip. So far we’ve seen Ålesund, Kristiansund and Trondheim. We drove the Atlantic Road and also went by Trollstigen. It was really beautiful. Other than that I hope to get a lot of new friends. 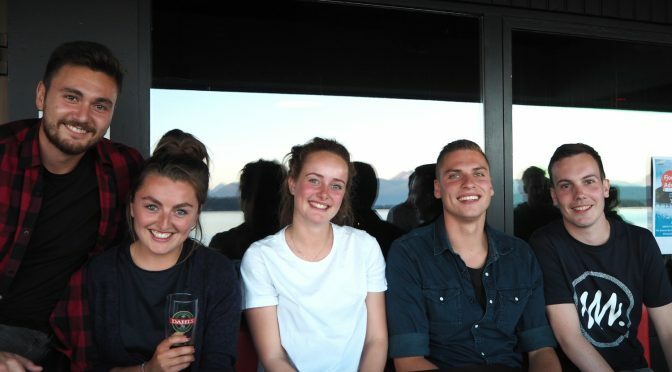 What are your expectations for your time in Molde: To learn Norwegian! This is my second masters degree, the first one I got from Høgskolen i Ålesund (now NTNU) so I already know how to say my name and some other basic Norwegian words. I also want to learn how to ski, swim and ride a bike. What are your expectations for your time in Molde: I already got some friends, that actually go to the same university as me in Seoul, but hopefully I’ll get more. It’s a beautiful country so I hope to get the time to go hiking and travel a bit around. It will also be an adjustment living in a small town; it’s 10 mill. inhabitants where I live! What are your expectations for your time in Molde: This is already my second year here, but I expect to get a lot of new friends. I’m a Fadder [en: Buddy] this year, so that will be fun. The nature and the landscape here is really spectacular and different from Cairo, also it’s fewer tall buildings here than what I’m used to.